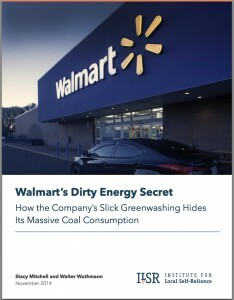 Walmart talks a lot of talk about its renewable energy initiatives, but a new ILSR report finds that all that hype is just slick greenwashing hiding the company’s massive coal consumption. In this first-of-its-kind analysis, ILSR calculated that Walmart is one of the nation’s largest users of coal-fired electricity. Despite pledging nearly a decade ago to shift to 100 percent renewable energy, Walmart today derives only 3 percent of its U.S. electricity from its renewable energy projects — far less than many small businesses and competing chains. Several national environmental leaders — including Michael Brune of Sierra Club, Bill McKibben of 350.org, and Jeremy Hays of Green For All — joined ILSR in releasing the study and calling for change. How much climate pollution does Walmart generate by consuming coal in your state? 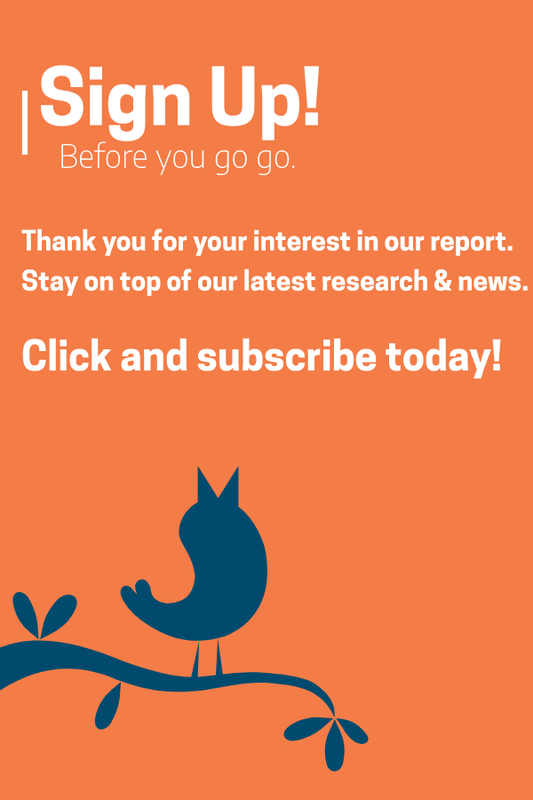 See the appendix of the report to find out! Also see our Grist post, Walmart is a Huge Consumer of Dirty Coal Energy. But off the stage and out in the real world, Walmart’s sustainability initiatives are heavy on admiration- inducing goals and astonishingly light on execution. Nearly a decade ago, the company pledged to shift to 100 percent renewable energy and acknowledged its responsibility to reduce its climate emissions as quickly as possible. Today, however, Walmart remains as deeply committed as ever to the dirtiest fuels, especially coal. It derives only 3 percent of its U.S. electricity from its renewable energy projects, down from 4 percent two years ago. In this first-of-its-kind analysis, ILSR provides new information about Walmart’s energy mix and environmental footprint. We calculate the total electricity use, coal-fired power consumption, and resulting carbon emissions of every Walmart store and distribution center in the country in 2013. We also evaluate the company’s renewable energy projects, finding that they are too small and located in the wrong places to have much of an impact on Walmart’s coal use and climate emissions. Our analysis finds that Walmart’s electricity consumption entails burning a staggering amount of coal: 4.2 million tons a year. That’s enough to give every kid in America a stocking filled with 126 pounds of the sooty stuff as a holiday present. 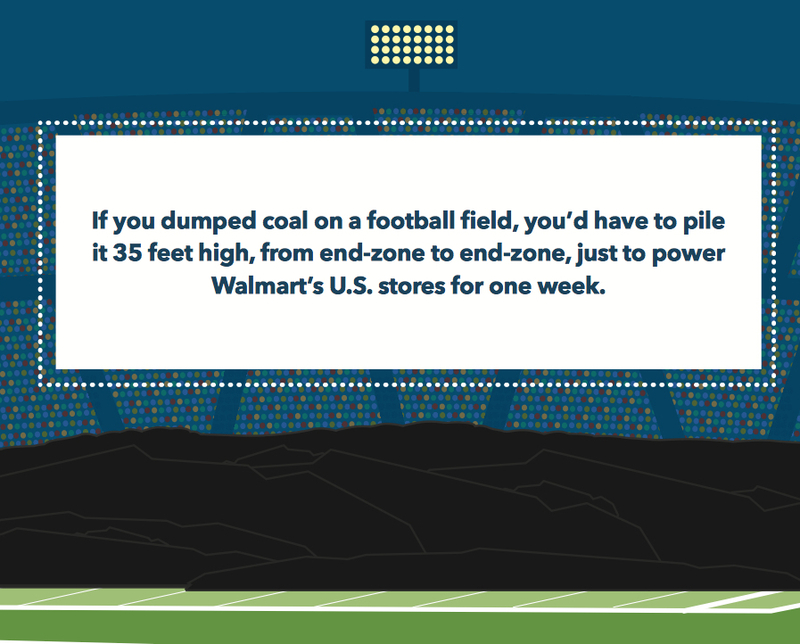 Or, to measure it another way: If you dumped coal on a football field, you’d have to pile it 35 feet high, from end-zone to end-zone, just to power Walmart’s U.S. stores for one week. Walmart sources more of its electricity from coal (40 percent) than the U.S. as a whole (39 percent) — a remarkable fact for a company that has touted its environmental responsibility for years. Indeed, we find that Walmart alone consumes 0.5 percent of all the electricity produced from coal in U.S., a stunning figure given the size of the entire national economy and population. Walmart’s use of coal-fired electricity in the U.S. accounts for 37 percent of its total reported global greenhouse gas emissions, and 74 percent of its U.S. emissions from electricity. Burning all that coal pumps almost 8 million metric tons of carbon pollution into the atmosphere every year. Because coal releases more carbon to generate the same amount of power relative to other fuels, Walmart’s use of coal-fired electricity in the U.S. accounts for 37 percent of its total reported global greenhouse gas emissions, and 74 percent of its U.S. emissions from electricity. The local consequences of the company’s heavy reliance on coal are severe as well. In states like Missouri and Illinois, where Walmart has no solar panels or other renewable energy projects, its stores draw power from a fleet of aging coal plants, which are poisoning the air and water. The Clean Air Task Force estimates that air pollution from coal plants causes over 13,000 deaths a year. Walmart’s renewable projects have hardly made a dent in its coal-generated power consumption and climate emissions, this report finds, in part because they are too modest in scale. Many other retailers are well ahead of Walmart in developing renewable power, including on-site installations. The renewable projects are also situated in the wrong places to have much impact. Two-thirds of Walmart’s rooftop solar is located in places where coal makes up less than 20 percent of the electricity these stores pull from the local grid. Meanwhile, across the most heavily coal-dependent regions, Walmart has only a few green power initiatives. As with every aspect of Walmart’s operations, cost is the only factor dictating its energy decisions. Walmart buys the cheapest electricity it can find. In a few places, that can mean wind or solar. But across much of the country, where coal-fired electricity is cheap and plentiful, Walmart does not invest in renewable power. Publicly, Walmart promotes itself as a leader on green power, but it is more forthcoming with investors. “The only [solar] projects that we were doing are the ones that economically make sense at the store level,” Marty Gilbert, Walmart’s director of energy, told Bloomberg News in 2012. Walmart wants all that coal kept cheap, too. The company contributes generously to politicians who support dirty energy. More than half of the candidates Walmart financed in the last election cycle voted with fossil fuel interests 100 percent of the time, according to voting data published by Oil Change International. Nine years ago, standing on the same stage as Manual Gomez did last month, Walmart’s then- CEO Lee Scott declared that the climate crisis was driving the company to act. “The science is in and it is overwhelming,” he said. “We believe every company has a responsibility to reduce greenhouse gases as quickly as it can.” But Walmart’s unwillingness to invest in alternatives in much of the country, where grid power is cheap and heavy on coal, has meant that the company’s reliance on the dirtiest fossil fuels, and its greenhouse gas emissions, have changed little from the day Scott made this speech. And its greenhouse gas emissions are even higher. 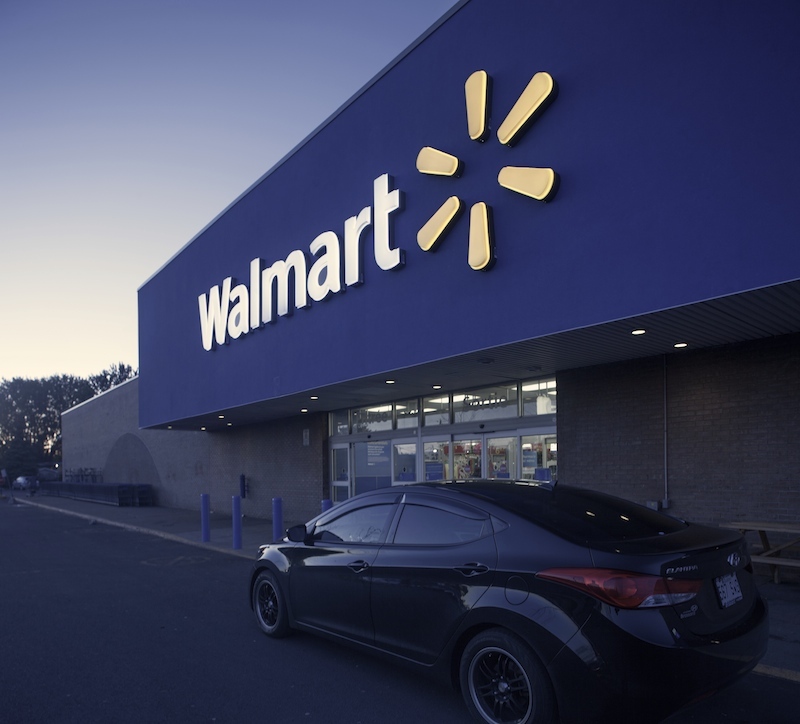 This report provides context for evaluating Walmart’s sustainability promises and brings new data to light that expose the company, not as an environmental leader, but as a massive, and committed, polluter. Thanks so much for researching/writing/publishing this! Although I *never* shop there, I was totally under the impression that W* *had* invested, substantially, in reducing its pollution & energy footprints (didn’t think about coal specifically). Thanks for clearing some of that up. Wow, Walmart’s use of coal is sickening! Sickening our air, water, soil; sickening fish, land animals, people; increasing global warming, acidifying oceans and more. 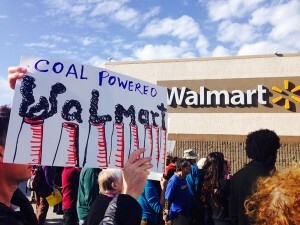 Come on Walmart, Stop Using Dirty Coal! CLEAN UP YOUR ACT!